We sought the most impressive marketing design solutions in the industry. Your works of communications art amazed us. Your designs were met larger marketing goals, informed your audience about an issue affecting society or told your brand’s story. Your websites were beautifully designed, creative and displayed innovative functionality. Your print designs were unique and perfectly positioned to appeal to your target demographics. Pop culture references sealed the deal for the Grand Prize Visual Design win. The winning infographic highlighted past success stories and served as a fundraising tool. 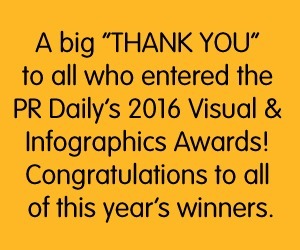 To everyone who entered PR Daily’s 2016 Visual & Infographics Awards, thank you for sharing with us! Energy Magazine, Fujifilm, Conduit, Inc. Safeguard DNews Newsletter, Safeguard Business Systems, Inc.
Bunkyo-ku Earthquake Disaster Survival Manual, Kartz Media Works, Inc.